The Library of Congress, located in Washington, D.C., is the national library of the United States, and represents the research arm of the U.S. Congress. It is one of the largest libraries in the world, holding more than 29 million books and printed materials in 470 languages. It is home to the world’s largest collection of legal materials and the largest collection of published aeronautical literature. The library holds the largest rare book collection in North America. The Library of Congress began with the limited mission of providing research support to members of Congress after the relocation of the federal capital to the new city of Washington, D.C. in November, 1800. Due to British soldiers burning of most of Washington, D.C. including the the U.S. Capitol building during the War of 1812, the original collection was destroyed. Ameliorating the disastrous effects of the loss, Thomas Jefferson donated his personal collection to the library. By some estimates his was the largest private library in the United States at that time. Today the library maintains its mission to support the Congress while also making its massive collection accessible to scholars worldwide. Libraries have played a historic role in the advance of civilization since ancient times. From collections of clay tablets found in ancient Mesopotamia to the digitized information of present day, the world's great libraries remain indispensable intellectual archives, enabling humanity to progress by the light of knowledge of the greatest thinkers of previous ages. The Library of Congress was established on April 24, 1800, when President John Adams signed an act of Congress allowing for the transfer of the U.S. Government from Philadelphia, Pennsylvania to the new capital city of Washington, D.C. The congressional act appropriated $5,000 for the purchase of a collection of books deemed necessary for the use of Congress, and for fitting the establishment of a suitable facility for containing them. The original library was housed in the new Capitol until August 1814, when invading British troops set fire to the capitol building during the burning of Washington, destroying the contents of the 3,000 volume library. Within a month, Adams' successor and third U.S. Thomas Jefferson offered his personal library as a replacement. Jefferson’s library was considered to be one of the finest in the United States, as Jefferson had spent more than 50 years accumulating books. The former president anticipated some controversy over the nature of his collection, which included books in foreign languages, and volumes of philosophy, science, literature, and other topics not normally viewed as part of a legislative library. In January 1815, Congress accepted Jefferson's offer, appropriating $23,950 for his 6,487 books, and the foundation was laid for a great national library. The Jeffersonian concept of universality, the belief that all subjects are important to the library of the American legislature, became the philosophy and rationale behind the comprehensive collection policy of the Library of Congress. On December 24, 1851, a fire destroyed the library’s 35,000 books, an original portrait of Christopher Columbus, portraits of the first five presidents, and statues of George Washington, Thomas Jefferson, and Marquis de Lafayette. By the end of the Civil War, the Library had recovered an estimated 82,000 volumes. 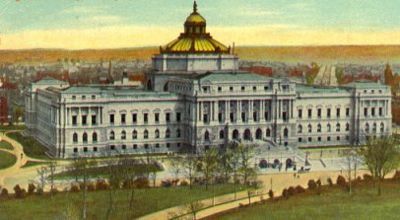 The Library of Congress began to grow and develop more rapidly with the addition of the Thomas Jefferson Building and institutional reorganization in 1897. Spofford's successor John Russell Young, though only in office for two years, overhauled the Library's bureaucracy, used his connections as a former diplomat to acquire more materials from around the world, and established the Library's first assistance programs for the blind and physically disabled. Young's successor Herbert Putnam held the office for forty years from 1899 to 1939, entering into the position two years before the Library became the first in the United States to hold one million volumes. Putnam focused his efforts on making the Library more accessible and useful for the public and for other libraries. He instituted the interlibrary loan service, transforming the Library of Congress into what he referred to as a "library of last resort." Putnam also expanded Library access to "scientific investigators and duly qualified individuals" and began publishing primary sources for the benefit of scholars. In 1914 Putnam established the Legislative Reference Service as a separative administrative unit of the Library. Based in the Progressive era's philosophy of science as a problem-solver, and modeled after successful research branches of state legislatures, the LRS would provide informed answers to Congressional research inquiries on almost any topic. In 1925 Congress passed an act allowing the Library of Congress to establish a trust fund board to accept donations and endowments, giving the Library a role as a patron of the arts. The Library received the donations and endowments of prominent individuals such as John D. Rockefeller, James B. Wilbur and Archer M. Huntington. Gertrude Clarke Whittall donated five Stradivarius violins to the Library and Elizabeth Sprague Coolidge's donations paid for a concert hall within the Library of Congress building and the establishment of an honorarium for the Music Division. A number of chairs and consultantships were established from the donations, the most well-known of which is the Poet Laureate Consultant. The Library's expansion eventually filled the Library's Main Building despite shelving expansions in 1910 and 1927, forcing the Library to expand into a new structure. Congress acquired nearby land in 1928 and approved construction of the Annex Building (later the John Adams Building) in 1930. Although delayed during the Depression years, it was completed in 1938 and opened to the public in 1939. Evans' successor L. Quincy Mumford took over in 1953. Mumford's tenure, lasting until 1974, saw the initiation of the construction of the James Madison Memorial Building, the third Library of Congress building. Mumford directed the Library during a period of increased educational spending, the windfall of which allowed the Library to devote energies towards establishing new acquisition centers abroad, including in Cairo and New Delhi. In 1967 the Library began experimenting with book preservation techniques through a Preservation Office, which grew to become the largest library research and conservation effort in the United States. Mumford's administration also saw the last major public debate about the Library of Congress' role as both a legislative library and a national library. A 1962 memorandum by Douglas Bryant of the Harvard University Library, compiled at the request of Joint Library Committee chairman Claiborne Pell, proposed a number of institutional reforms, including expansion of national activities and services and various organizational changes, all of which to shift the Library more towards its national role over its legislative role. Bryant even suggested possibly changing the name of the Library of Congress, which was rebuked by Mumford as "unspeakable violence to tradition". Debate continued within the library community until the Legislative Reorganization Act of 1970 shifted the Library back towards its legislative roles, placing greater focus on research for Congress and congressional committees and renaming the Legislative Reference Service to the Congressional Research Service. After Mumford retired in 1974, Gerald Ford appointed Daniel J. Boorstin as Librarian. Boorstin's first challenge was the move to the new James Madison Building, which took place between 1980 and 1982. The move released pressures on staff and shelf space, allowing Boorstin to focus on other areas of Library administration such as acquisitions and collections. Taking advantage of steady budgetary growth, from $116 million in 1975 to over $250 million by 1987, Boorstin actively participated in enhancing ties with scholars, authors, publishers, cultural leaders, and the business community. His active and prolific role changed the post of Librarian of Congress so that by the time he retired in 1987, the New York Times called it "perhaps the leading intellectual public position in the nation." Ronald Reagan appointed James H. Billington as the thirteenth Librarian of Congress in 1987, a post he holds as of 2008. Billington took advantage of new technological advancements and the Internet to link the Library to educational institutions around the country in 1991. The end of the Cold War also enabled the Library to develop relationships with newly open Eastern European nations, helping them to establish parliamentary libraries of their own. In late November 2005, the Library announced intentions to launch the World Digital Library, digitally preserving books and other objects from all world cultures. The primary responsibility of the library is to serve members of Congress in the objective research of congressional agendas. This responsibility is handled by the Library's Congressional Research Service (CRS). This branch was designed for the exclusive use by the U.S. legislature and assists members of congress in their legislative and representative functions. The CRS is estimated to answer more than five thousand requests for information per year and maintains specialized reading lists, automated information systems, and several research subdivisions for the personal use of congressional representatives and their staff. Annual events of the Library of Congress include the National Book Festival, the Founder’s Day Celebration, the Archives Fair, and the Davidson Fellows Reception. 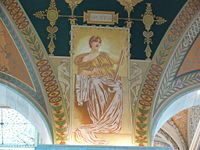 The Library of Congress serves as a legal repository for copyright protection and registration, and is the base for the United States Copyright Office. Regardless of whether they are seeking copyright, all publishers are required by “mandatory deposit” to submit two copies of their "copyrightable" works to the library. Each business day, nearly 22,000 new items published in the United States arrive at the library. The library does not retain all of these works in its permanent collection, but does add an estimated ten thousand items per day. Rejected items are used in trades with other libraries around the world, distributed to federal agencies, or donated to schools, communities, and other organizations throughout the United States. As is true of many national libraries, the Library of Congress retains copies of every publication in the English language. The Library of Congress exists on congressional appropriations, and an income sustained through the establishment of library funds. In addition to welcomed donations, the library relies on the contributions of national foundations and private sources through the Library of Congress Trust Fund Board. The Librarian of Congress is a position appointed by the president of the United States with the consent of the U.S. Senate. Under President Lincoln, the Librarian of Congress was awarded two free copies of every publication submitted for copyright in the United States. This allowance stands today. Library of Congress, Thomas Jefferson Building. 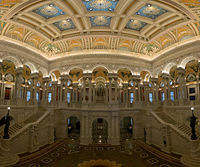 The Library of Congress holds an esteemed collection of publications, including more than 32 million cataloged books and other print materials in 470 languages; more than 61 million manuscripts; the largest rare book collection in North America, including the rough draft of the Declaration of Independence, a Gutenberg Bible (one of only four perfect vellum copies known to exist); over 1 million US government publications; 1 million issues of world newspapers spanning the past three centuries; 33,000 bound newspaper volumes; 500,000 microfilm reels; over 6,000 comic book titles; and the world's largest collection of legal materials. The library also houses an extensive collection of interactive media, including films, 4.8 million maps, sheet music, 2.7 million sound recordings; more than 13.7 million prints and photographic images including fine and popular art pieces and architectural drawings; the Betts Stradivarius; and the Cassavetti Stradivarius. The library is home to the world’s largest collection of published aeronautical literature, and possesses the personal papers of most U.S. presidents including George Washington and Abraham Lincoln. The library also holds an array of personal papers from various figures around the world including Margaret Mead, Henry Kissinger, Thurgood Marshall, and Sigmund Freud. The collection includes one of the three existing Gutenberg Bibles, and a Sumerian scripted tablet dating back to 2040 B.C.E.. The Library of Congress is widely recognized as the largest library in the world, based on the shelf space its collection occupies. The library states that its collection covers approximately 530 miles. The British Library is reported to cover an estimated 388 miles of shelf space. The Library is estimated to hold, if digitized and stored as plain text, 10-20 terabytes of information. The Library of Congress makes millions of digital objects available at its American Memory site. American Memory is a source for public domain image resources, as well as audio, video, and archived Web content. Nearly all of the listed holdings can be found directly on its web site. Librarians all over the world consult these catalogs when seeking to add to their collection a book published in the United States. Using the Library of Congress Control Number, librarians can make sure of the exact identity of the book. 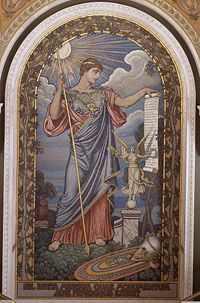 The Library of Congress also provides an online archive of the proceedings of the Congress of the United States including bill text, Congressional Record text, bill summaries, the Congressional Record Index, and the U.S. Constitution. The library also administers the National Library Service for the Blind and Physically Handicapped, an audio and Braille library program provided to more than three-quarters of a million Americans. The Library of Congress also provides an online archive of the proceedings of the U.S. Congress at THOMAS, including bill text, Congressional Record text, bill summary and status, the Congressional Record Index, and the United States Constitution. The Library also administers the National Library Service for the Blind and Physically Handicapped, a talking and braille library program provided to more than 766,000 Americans. The congressional library developed a system of book classifications called the Library of Congress Classification, or LC Classification. These classifications are used by most U.S. research and university libraries, though most public libraries continue to use the Dewey Decimal system of classification. The preservation of the library’s collection revolves around the conservation, binding, and digitization of the institute’s original materials. Publication preservation is conducted by the Library’s Preservation, Research and Testing office, which is responsible for ensuring the general survival, conservation, and public availability of each article of the congressional library. The library is open to the general public for academic research and runs tours for visitors. Only those who are issued a "Reader Identification Card" may enter the reading rooms to access the collection. The Reader Identification Card is available in the Madison Building to persons who are over 18 years of age upon presentation of a government-issued picture identification card. Only certain government officials, including Supreme Court Justices and their staff and members of Congress and their staff are allowed to check books out. University libraries may also request items through interlibrary loan from the Library of Congress, if no other American institution possesses the item. The library is also involved in various standard activities related to bibliographical and search and retrieve standards. The Library of Congress remains the largest up-to-date library in the world, and employs a number of technological initiatives to stay current. In order to make its diverse collection of resources readily available, the Library of Congress has established an office of strategic initiatives, an information technology service, and the most comprehensive online library in the world through the National Digital Library Program. The National Digital Library Program has allowed the Library of Congress to make its digitized collection easily accessible by a worldwide public audience. The library’s resources and collections can be accessed free-of-charge via the internet and includes millions of records, online library exhibitions, and the entire card catalogue of the congressional library. The program has also established a comprehensive database, known as THOMAS, for the use of Congress members and their staff, and offers an optical disk system for Congressional members to supply them with a pocket library of public policy. Though the times have changed and resources have advanced, the mission of the Library of Congress has remained the same. 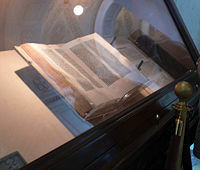 The institution continues to serve members of Congress in the objective research of congressional agendas, uphold a universally available collection, sustain and preserve this collection, and to establish general policies and administrative duties to support and complete the mission of the congressional library. History of "Library of Congress"